Ok, since you asked. I'm sure my local big box stores have all the 2016 I could want, as well as my LCS, but what I don't have is money. I find that no matter my ravishing looks and sparkling personality, those alone will not score me even a common of Matt Wisler. 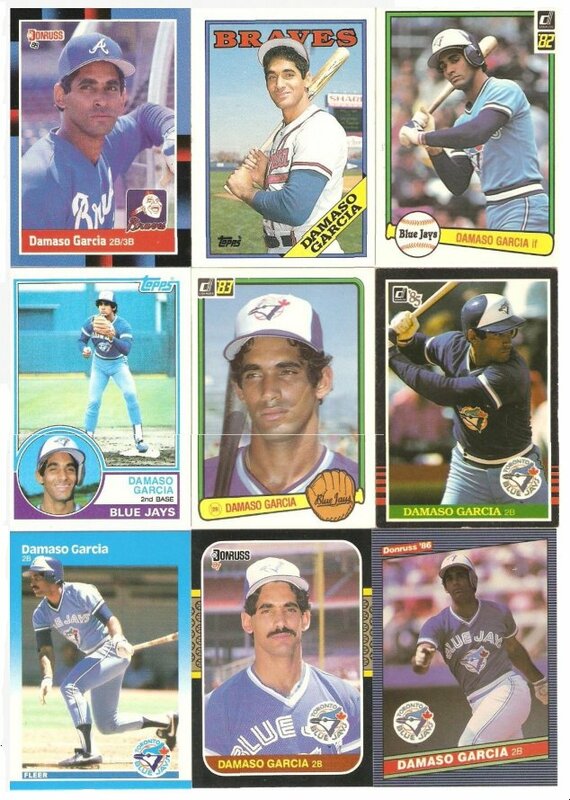 However, have your pick of Damaso Garcia....but just one. Oh well, as I mentioned at the start of January, I will not be building a 2016 set anyway. 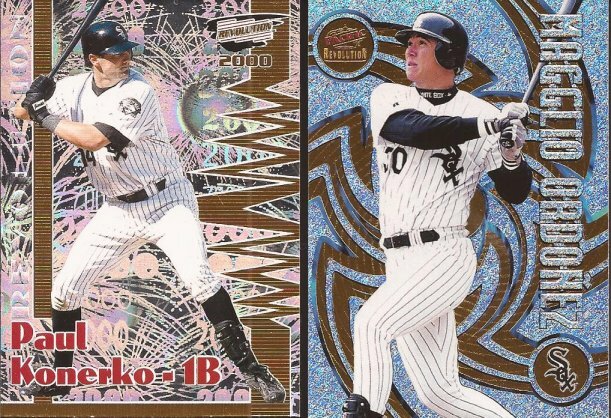 I am in Nacho Grande's case break, so I will secure my White Sox team set, and hopefully the few inserts of ChiSox in the set and if I feel like picking up a factory set, then I will. But seeing the cards other people have posted, I am glad I'm sitting this year out. It's not as horrible a release as 2014 was, but if I can save my pack cash for other things, I'll be far happier in the long run. 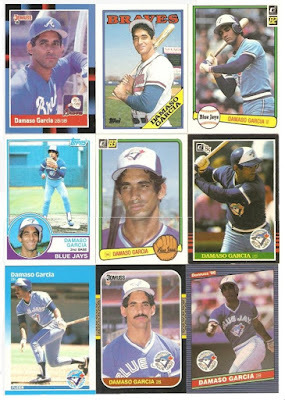 So instead of 2016, let's show off some cards I got from the other Jeff in the blogsphere, he of Wish They Still Came With Bubblegum fame. 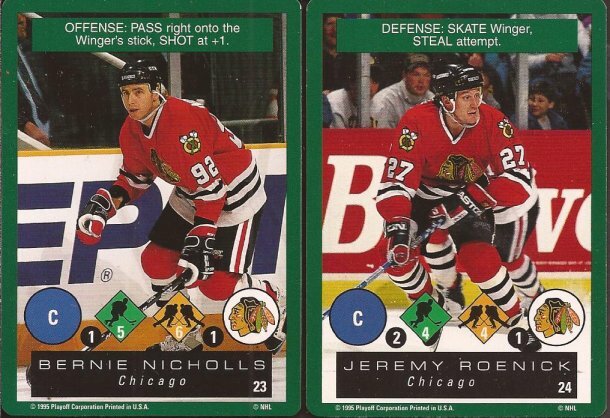 Any mailing from Jeff is sure to have a Blackhawk or two within, and Jeff had even more than two. But these two jumped at me. Similar to the Topps Attax, or any of the other tries by Topps to make a card playing game, these come from Playoff One on One Challenge card game. Ok, I get the idea of the game, but Playoff really doesn't know the players. Roenick was an ok defensive forward, but that wasn't his game like it is for Hossa, Getzlaf and other potential Selke award winners. Goooooooooooooold Label. I will find a box of that one day to rip. Oh....I will. Two for the Sox box of Magglio. Middle is one from Panini's "we're going to milk baseball for whatever we can" releases, this time showing the ball players as college athletes. It's White Sox, though, so into the collection it goes. "Could you put some fireworks and other stuff in the background? It looks a little too plain". Jeff, thanks again for the cards. And then some wiseguy said, "That's so cool! You know what would make it even better. Take away the picture of that guy. It's distracting." Awesome card! "Middle is one from Panini's 'we're going to milk baseball for whatever we can' releases, this time showing the ball players as college athletes." They may be milking it, but I'm still a sucker for that sort of gimmick; I'll line up for collegiate cards every time. You get +10 points for the Tonic video. That was a blast from the past.